Two years ago, when Panalpina started with the assembly of SKD units for base stations of mobile networks in Brazil, this outsourced manufacturing marked a pioneering step for both the logistics and telecoms industry. 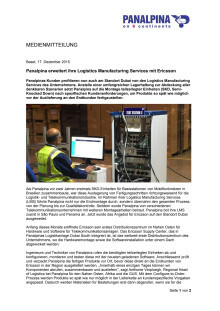 In what Panalpina calls Logistics Manufacturing Services (LMS), the company not only executed the final assembly, but took full ownership of the whole process – from planning to quality control. Since then, telecoms companies have entrusted Panalpina with more manufacturing work. Panalpina first offered LMS in São Paulo and Panama. Now Dubai has been added for Ericsson. Earlier this month, Ericsson officially inaugurated its first telecom equipment hardware and software distribution center in the Middle East. 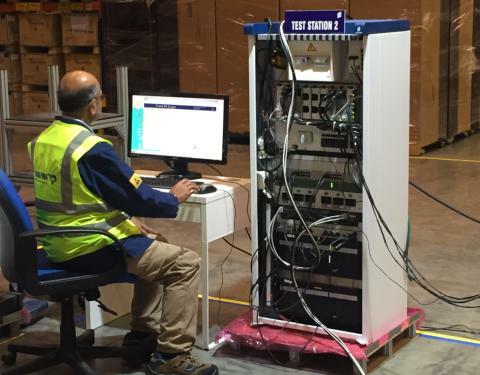 The Ericsson Supply Center located in Panalpina’s Dubai South facility is the company’s first distribution center globally that unites hardware assembly and software load under one roof. Panalpina engineers and technicians pick SKD units, configure, assemble and test them with the latest software uploaded. Panalpina then inspects and packs the finished products on site before delivering them directly to Ericsson’s end customers in the region. “We can call off components, manufacture and ship in one day,” says Anthonie Verploegh, Panalpina’s regional head of logistics for the Middle East, Africa and CIS (MEAC). The configure-to-order process customizes the product as late as possible in the supply chain. It allows materials to be allocated against orders only when required in the order fulfilment process. “With this postponed manufacturing approach, customers like Ericsson can significantly reduce working capital requirements and order fulfilment lead times,” adds Verploegh. Ericsson’s customers, the mobile operators in the region, also benefit from more flexibility, shorter network roll-out times and, ultimately, a higher return on investment as they build their networks. To be able to support Ericsson, Panalpina Dubai was required to obtain an assemblies trade license in addition to its logistics trade license. Prior to that, the new customs processes that would result from the manufacturing operations had to be vetted and approved by Dubai Customs. 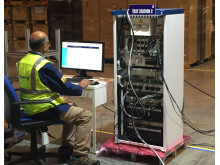 Since go-live of the operations in November 2015, Panalpina has successfully completed various Ericsson process verification tests and is now accredited to fully assemble and test different cabinets. 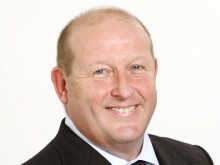 Mike Wilson, Panalpina’s global head of Logistics, adds: “This is a significant milestone for Panalpina. Dubai is developing into a show case site for the region. It is a perfect example of how we are executing on our highly successful LMS strategy."